Combine all quinoa mix ingredients (quinoa, orange zest, orange juice) into a medium bowl until well blended. Can be made up to 2 days ahead and kept refrigerated. Combine all yogurt mix ingredients (Greek yogurt, CARNATION BREAKFAST drink, vanilla extract, cocoa powder, orange zest) in a separate medium size bowl until well blended. Can be made up to 2 days ahead and kept refrigerated. Place ¼ of the quinoa mix into each glass or cup. Spoon a ¼ of the yogurt mixture on top of the quinoa, then lay a ¼ of the clementine segments on top. 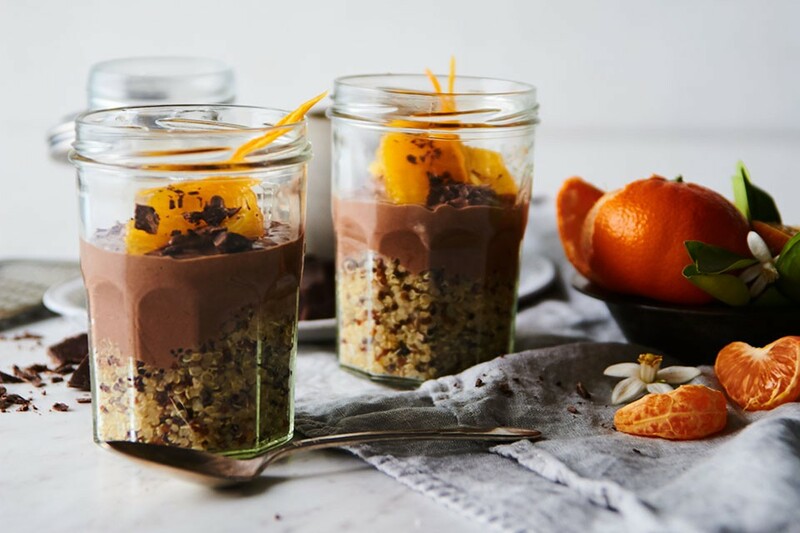 Create another layer with the remaining ingredients: quinoa, yogurt, clementines. Garnish with ½ teaspoon of chocolate chips on each parfait. Refrigerate up to 2 hours if not eating immediately.